So, a couple weeks ago, Beuc contacted Seth Robinson and I about a directory traversal security flaw with Dink Smallwood D-Mods. The software that is used to unzip D-Mods (from bzip2 format) did not protect against unzipping files up-and-out-of the D-Mod destination directory, potentially allowing D-Mods to overwrite arbitrary user files on a hard drive. I helped confirm that no current D-Mods exploited this functionality, as well as perform Windows testing and point out potential corner-cases. And, now, Dink Smallwood HD v1.91 is available for everyone to download, now without any security vulnerabilities. Coincidentally, after we had begun work and a few days before the fixes were published, the Zip Slip Vulnerability was fairly widely advertised. Beuc assured me this was a coincidence. For more details on CVE-2018-0496, see Mageia. 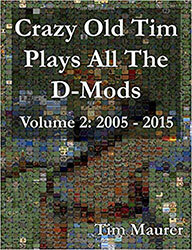 Crazy Old Tim Plays All The D-Mods Volume 2: 2005-2015 s now available to purchase. This volume weighs in at a svelte 398 pages. While I did not write this (Tim Maurer did before he died), I did all of the editing and formatting and ‘publishing’. The cover is a photo-mosaic of the Malachi character from Tim’s ‘Malachi the Jerk’ D-Mod. I recently had an idea for a weird ‘huge’ game that would combine a bunch of different ideas together, so I thought I’d try to see what I could spin up with Unity. I’ve heard of it mentioned favorably, and I really haven’t tried to do any non-Dink Smallwood related game development since Torque2d (Surgery Slice). 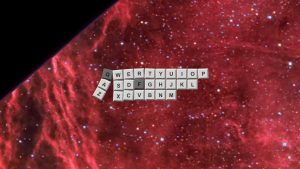 Before getting too far into creating a game that may-or-may-not-be-feasible, I decided to to create a super tiny prototype toy called ‘USS QWERTY‘. And here I thought I was a unique snowflake, but I just thought to check, and there are at least 21 other references to ‘USS QWERTY’. Alas. 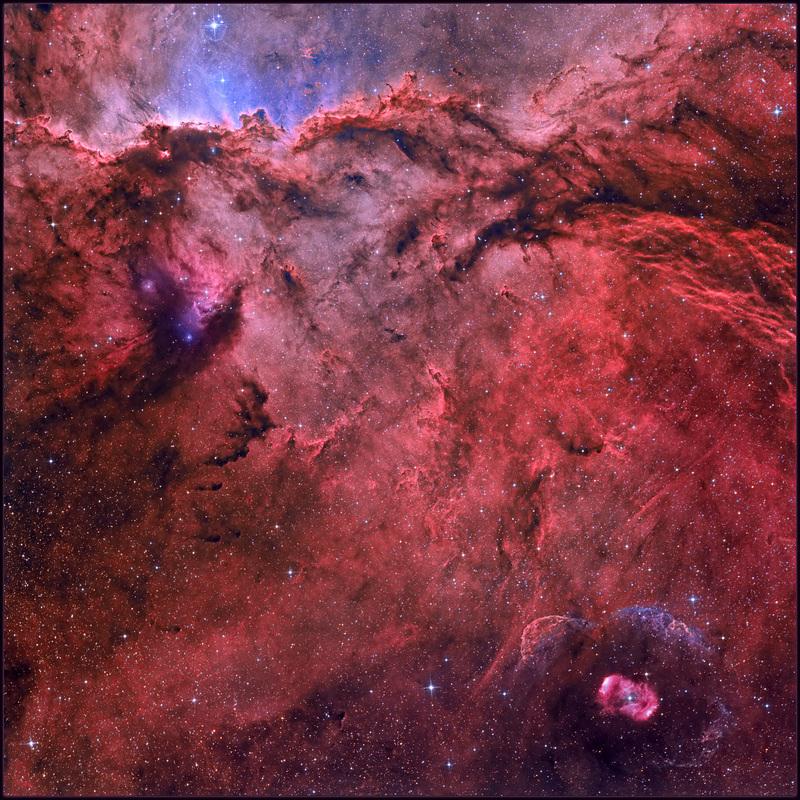 USS QWERTY lets you command a keyboard/starship over NGC 6188 and NGC 6164. There’s no goal, plot, or anything else of the sort, but it seems to do what I wanted fairly well. You can ‘play’ it in a browser here. There’s a really nice design/play feedback loop; make a change, click play, try it, make another change, click play, try it again. The documentation is really excellent; videos, tooltips, great documents describing what everything is (like a ‘Rigidbody 2d’). I created something that ‘works’ in less than a day. At one point, I thought I broke my script when nothing responded to the keyboard. I spent a while trying to debug my script, but it ended up being some sort of ‘Unity’ issue; closing and restarting resolved the issue. I had a heck of a time trying to build the application for WebGL. It gave me several cryptic error messages. Restarting my PC resolved this. When running the windows version, with Very Low or Low graphics, the physics are all out of control. Still, though, very nice. I may end up trying to turn USS QWERTY into an actual game, as I continue working through ideas. 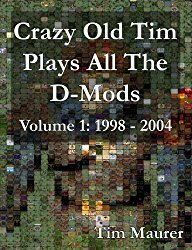 Crazy Old Tim Plays All The D-Mods Volume 1: 1998 – 2004, a 430 page physical book (!) is now available for purchase. For those of you who haven’t been following The Dink Network, something really cool happened a few years ago. Tim Maurer (aka CocoMonkey) decided to play through every D-Mod ever released, and write about his experiences as he went. He decided to call this project ‘Crazy Old Tim Plays All The D-Mods’ (COTPATD). Along the way, he covered all 355 D-Mods, and wrote just under 300,000 words in total. His writing was pretty darn brilliant, and was witty, thoughtful, personal, and hilarious. Tim wrote COTPATD because he “wanted to give something back to a community that meant a lot to [him] when [he] was younger”, and I believe that publishing his work in book-form continues that goal. 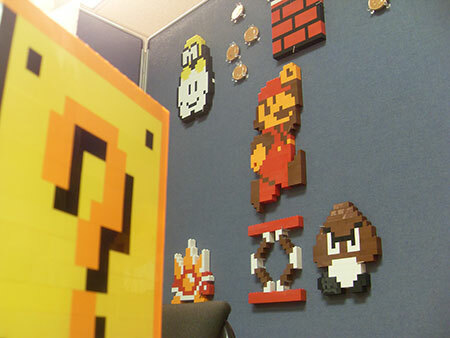 COTPATD is a glimpse at our community through the silly games that we created together, and having that on a bookshelf makes it more ‘real’ than a web page that might disappear overnight. I think it is also important to recognize Tim’s achievement, as sad as it is that he isn’t around to see this. In editing COTPATD, I fixed a few typos and grammar mistakes, and added a few missing screenshots. I also trimmed out a tiny amount of content for formatting purposes. However, I also added some additional ‘context’ to Tim’s entries, including the community response to the COTPATD project, old forum posts, alternative reviews, and some historical snapshots of what was going on in the community while the D-Mods were released. Seth (aka RTSoft) released a new update to Dink Smallwood HD that is available free for a lot of platforms (Windows, iPhone/iPad, Android). I helped beta test (and found a ton of neat obscure bugs), and even contributed some code to make shadows alpha-transparent and support reading ‘png’ images. 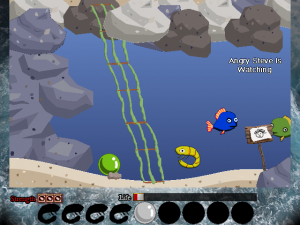 I created a new D-Mod called Bloop’s Purpoise for the Bloop the Fish Contest that started on April Fool’s Day. In this adventure, Bloop learns why he is a fish. I created a new D-Mod, Cast Awakening Part 5: Revolution. This is a little bit different than most, because it is the first ‘rogue-like-like’ D-Mod. 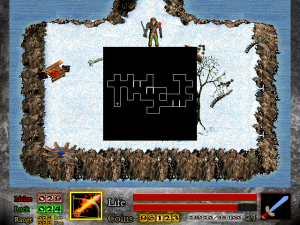 Each map and screen is randomly generated. There are a bunch of different levels, monsters, and some new weapons/spells. Footbreak is an alternative GUI for the Handbrake video encoding software. It’s goal is to make ripping television shows as simple as possible. Simply select an ISO file (that has been decrypted with DVD Decrypter), search for the television show, select the season, and relate each episode with a DVD Title. Once you’ve done this for all of your ISOs, specify your video settings, and walk away from your computer. Version 0.0 is available for download (155 Kb). Full source code is included. Screenshots that detail the wizard process are available after the jump. 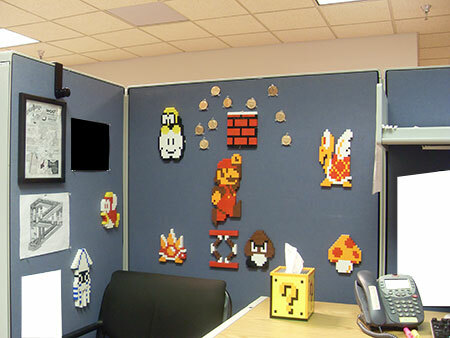 I have decorated my work area. 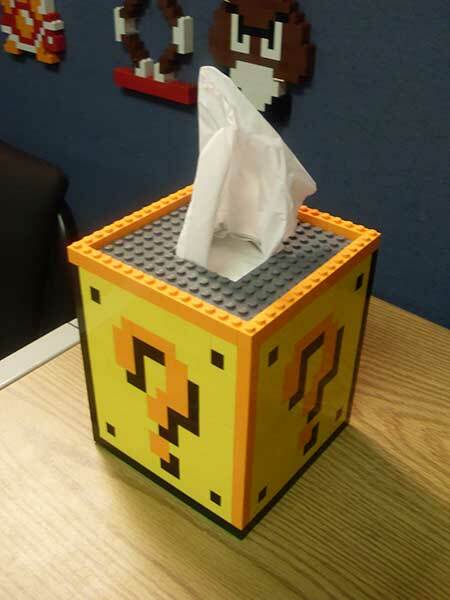 I have the best kleenex box in the world. 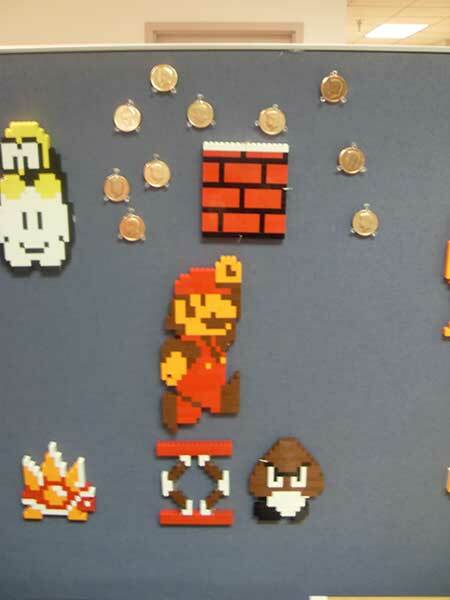 And yes, those are chocolate coins. 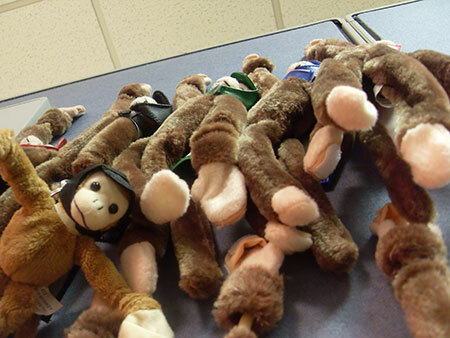 I also have too many woot monkeys. Scribblenauts may be the best video-game-as-a-toy of all time. Sure, most games try to excel when it comes to gameplay, story, or even graphics… but Scribblenauts is simply fun. 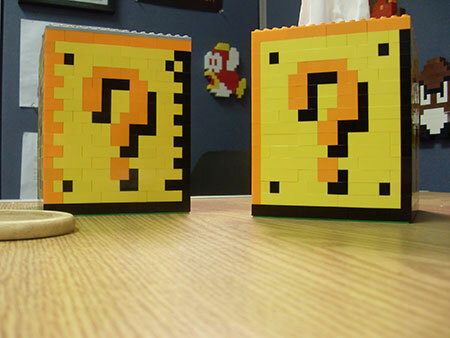 The game is essentially a series of puzzles. To solve the puzzles, you can conjure just about any non-trademarked noun available by typing it in. For example: want to kill a shark swimming around? Drop a toaster into the water. 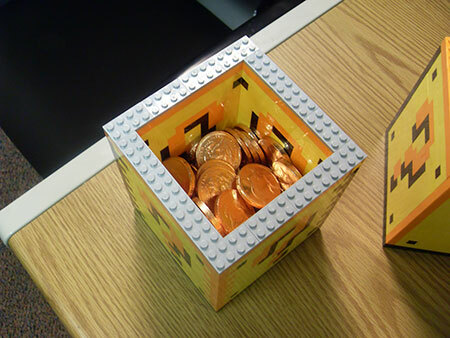 Best of all, there is a completely unstructured ‘sandbox’ you can play in, where you can see how different things interact with each other. 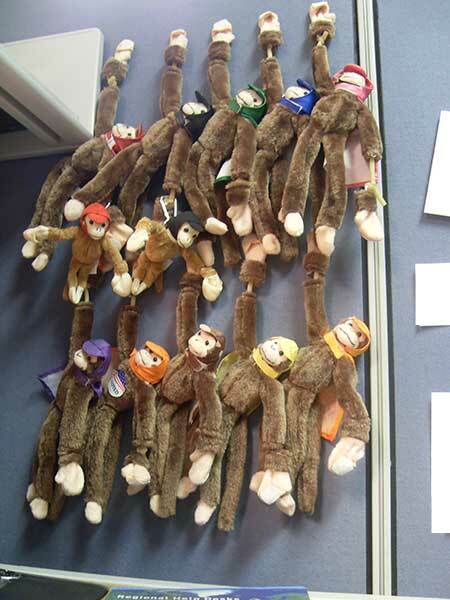 You can summon pirates, ninjas, god, lions, giant squids… just about everything, and usually they’ll attack each other. I summoned a ‘blob’, basically a stereotypical green-gooey sentient blob. The blob seemed to be the most powerful creature in the game… it handily defeated god, lion, tiger, devil, giant squid, leviathan, colossus, soldier, zombie, robot zombie, puma, bear, and everything. Except vampire. Blob and vampire will fight forever, neither able to harm each other. However, terrorist can defeat blob… sort of. When the terrorist dies, he blows up, taking the blob with him. The terrorist cannot kill vampire, because the vampire turns the terrorist into a vampire-minion before he can die. At one time, Santa ran for his life from the vampire and a vampire minion. They decided to kill Santa, instead of turning him. However, I gave Santa some garlic, and boy, vampire ran away and cowered in a corner. I accidentally made Santa drop the garlic, which fell on the vampire’s head, vanquishing him. I just have the greatest grin in my face when I play this game.